passionate about their region and their wines. Cumberoona Vines is a small 14 ha family owned vineyard with a current reputation for growing high quality Cabernet Sauvignon grapes. It was planted in 1998 on lane acquired from the original Stuart owned Cumberoona property. At this time a great deal of enthusiasm was shown in the potential for this land to produce excellent fruit - in conjunction with the quality of water available for irrigation this proved to be correct. Until recently the vineyard was operated and worked by the family members. In 1999/2000 Hamilton’s Ewell Vineyards Pty Ltd, commercial grapegrowers, planted its’ 80 hectare Limestone Quarry Vineyard on Rochow’s Wray Road located approximately 4.5km east/north east of the famed Naracoorte caves. This is in the heart of the best and most intensive vineyard plantings of Wrattonbully. Full details and information regarding the vineyard can be found on our website. Grapes/Wines Produced: Hollick Shiraz, ‘The Toreador’ Tempranillo, ‘The Renegade’ Sangiovese Cabernet and ‘The Stock Route’ Shiraz Cabernet blend. Seeking to add diversity to their Coonawarra holdings, the Hollick team specifically sought a site in Wrattonbully which was suited to the production of premium wine grapes. The vineyard of 30 hectares was developed in 1998, giving Hollick over 90 hectares of vineyard in total. The Wrattonbully vineyard is aptly named Red Ridge and is planted predominantly to Shiraz. The Hollick team set out to push the boundaries by planting alternative varieties such as Tempranillo and Sangiovese, and added Cabernet Sauvignon so that they could emulate the Tuscan style of a Sangiovese Cabernet blend. Wrattonbully on the Limestone Coast is a land of ancient Terra Rossa soils over a maze of limestone caves – a place of discovery. We named our Wrattonbully vineyard in honour of Australia’s acclaimed geologist and iconic Antarctic explorer, Sir Douglas Mawson. Only the highest quality fruit is sourced from their estate-owned and managed vineyards, ensuring an unwavering commitment to quality and delivering handcrafted, premium wines with Regionality and Personality. When we first combined to plant vineyards in 1995, our sole aim was to produce quality red and white grapes for premium brands. Years later, this passion and involvement in the industry resulted in Pavy Wine’s first wine production, a full bodied Cabernet, released in 2001. Today, together with our love of food and wine, Pavy Wines continues to grow a boutique range of wines the Ottoson family are passionate about. Pepper Tree is a five star winery owned by former geologist John Davis and his family. The company owns the 100 hectare Stonefields vineyard on premium terra rossa soils in the Wrattonbully region from which it produces around 20 000 cases of wine per year. These include six single vineyard red wines which in the past 5 years have been awarded 18 five star Halliday ratings and over 100 National wine show medals. In the Limestone Coast wine show, Pepper Tree has won 17 gold medals and 11 trophies over the past 5 years including Most Successful exhibitor in 2014 and Best Wine of Show in 2015 and 2016. Smith & Hooper wines are sourced entirely from two Wrattonbully vineyards, previously farmed by the Smith and Hooper families. These are premium wines from exceptional vineyard sites featuring Terra Rossa, a rich, free draining soil that is considered by many as the viticultural equivalent of gold. Extensive trials have led to us focussing on Merlot – a wine expressly suited to the region. Terre à Terre, a French expression meaning Down to Earth, is a small Australian wine domaine run by husband and wife team Xavier Bizot and Lucy Croser. Since 1853, five generations of publicans, tavern-keepers and winemakers have graced the Tidswell family tree, with characters as rich and vibrant as the remarkable wines that bear their family name. Today, Ben and Andrea are committed to growing and producing fine wines, reflecting the people and places that have helped forge that tradition. From the refined elegance of the Jennifer, and the distinctively tantalising Heathfield range, to the ever-approachable Publicans series, Tidswell Wines captures the essence of family – its kinship, its home and its heritage – to craft wines that are as much about style as they are about enjoyment. Established in 1849, Yalumba is Australia’s oldest family owned wine company and remains fiercely independent and progressive through exclusive ownership by the Hill-Smith family. Yalumba is one of the most influential producers of Viognier in the world, it’s presentation of the FSW8B Botrytis Viognier from Wrattonbully reflects the history, innovation and experimentation that went into this wine’s development. Autumn in Wrattonbully presents dewy mornings, soft mists and warm sun on ripe grapes, perfect for ‘Botrytis cinerea’ and the naturally alluring Viognier grape to link and create the golden nectar that becomes FSW8B. The first plantings of Shiraz and Cabernet Sauvignon (16.5 hectares) were established on the Malone property ‘Talinga’ in 1998. These plantings were the next step in the evolution of the farming business. The vineyard site was selected for its gentle slope and free draining loam soils over limestone, these features matched with the cool climate, support the production of premium red wine grapes. In more recent years the plantings of Chardonnay (5 hectares) and Shiraz (2.25 hectares) occurred in 2002 and 2004 respectively. The Chardonnay was planted with a view to expand the range of varieties produced on the property and further capitalise on the cool climate characteristics of the Wrattonbully region. In 2014 the Malone Wines purchased Mosquito Creek vineyard which is located in the heart of Wrattonbully with Cabernet Shiraz and Merlot the 3 varieties planted on the 10 Ha block established in 2002. Quality is the main focus for both vineyards with the fruit ripening slightly earlier at the Mosquito Creek site even though the vineyards are less than 10 km apart helping logistically at vintage time. The vineyard was established in 1999 to compliment the family farm at Hynam in the Wrattonbully region. In the first year we planted 6.73 ha of Shiraz and 3.32 ha of Cabernet Sauvignon. In 2000 we planted 3.21ha of Cabernet Sauvignon and 3.99 of Merlot. The vineyard soil profile is sandy loam over clay planted in 3 Metre row widths on a gentle slope with the rows running in a North South direction. In 2016 the Merlot was pulled out to be replaced with Shiraz, as this has proven to be a favoured variety for this site. We are passionate grape growers and strive to produce a quality grapes for the premium market. Located on a 20Ha vineyard on Rochow Wrays Road in the Wrattonbully Wine Region, Yelloch Creek is a producer of Cabernet Sauvignon and Shiraz grapes for bulk wine. Cape Jaffa Wines grow their own biodynamic fruit and also collaborate with a number like-minded growers across the Limestone Coast who share their sustainability conscience. Their portfolio is grouped into two distinct moods, one that reflects the vineyard ‘wines bout place’ and one that’s about winemaking ‘wines about style’. Along with their own soil in Mount Benson, Wrattonbully is a favourite region of both Anna and Derek, featuring as a major blending component in many of their Limestone Coast wines. As part of their ‘wines about place’ range, they have single vineyard label ‘En Soleil’ which showcases the consistently good quality they see from Greg Koch’s biodynamic vineyard. Wongary of Wrattonbully is owned by Andrew Peace Wines, well renowned 4.5 star rated James Halliday Winery. Andrew Peace Wines sells all around the world and is highly regarded. 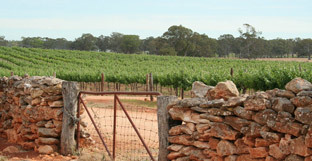 The vineyards were established at Wongary in 1998 and are situated in Joanna ,18kms south of Naracoorte. The name Wongary is derived from an aboriginal name, which means waterhole. The cottage of Wongary looks over this waterhole. When there has been plenty of rain, we are lucky to have wonderful birdlife. The soil of the Wongary Vineyard is the famed Terra Rossa, similar to the soil of Coonawarra. This wonderful rich red soil and its underlying limestone , supplies balanced nutrition, allowing the grapes to achieve concentrated fruit flavours ,without excess vigour. Andrew Peace Wines are excited for the future of being a part of the highly regarded Wrattonbully Region . The Land of Tomorrow wines take their name from the translation of the indigenous word ‘Kanawinka’, which is the name of the fault line that runs through the Wrattonbully wine region. "The name not only reflects the unique geological features of the region, but it also echoes to us the timelessness of this place and the responsibility we have in caring for it”, Susie Harris, owner and vigneron. Our vineyard is a cool and undulating place. Here we grow and hand pick small and pristine parcels of chardonnay and shiraz which are both wild fermented and made with minimal intervention and sympathetic use of oak. Jane and Claire are sisters. Their common love of family, farming and wine brought them to purchase and expand Lanacoona Estate, an established vineyard in Wrattonbully in 2002. With eight children between them, Eight at the Gate is a common sight around the property. The vineyard has been providing grapes and wine for many iconic wine labels for the past 20 years. Since 2005 we have produced our own wine with fruit chosen from the best parts of the vineyard. In 2016 we finally put a label on it and Eight at the Gate Wines was born. The vineyard is situated 17 kilometres from Naracoorte on the Wimmera Highway. Planted in 1999, 2000 it is 14 ha of Shiraz and merlot with a smaller 2 ha lot of Chardonnay. The soil type is sandy loam over clay. Irrigation is a dripper system fed from a natural billabong on the property. Normal production is approximately 70 tonne of both Shiraz and Merlot. Broken Windmill Vineyard is a 12 Ha vineyard that was established in 1999 , with plantings of Shiraz 2.0Ha (BVRC30) and 10 Ha Cabernet Sauvignon. Rather than plant clones Pete selected cuttings from old established Coonawarra Cabernet vineyards ( planted in the 1950-1960s) that he had made previously made wine from and liked the flavour profile and tannin quality. Pete Bissell has had a 30 year career making wine for initially Wynns Coonawarra Estate and for the last 22 years Balnaves of Coonawarra. Pete was the Gourmet Traveller winemaker of the Year in 2005 and Balnaves was James Hallidays Winery of the Year in 2008. Pete has made wine from Wrattonbully since 2002 for various customers , but all Broken Windmill vineyard is currently sold as fruit. Louise Dickens is a Horticulturalist specialising in entomology and plant pathology, and runs her own business Dickens Vineyard Technical Services PL monitoring for pests and diseases in many vineyards across the Limestone Coast. Together managing the vines on this long narrow little vineyard next to the Riddoch Highway, which sits on a thin strip of undulating terra rossa soil on shallow limestones, on what was the ancient shoreline of Australia. When head and heart combine, the magic that is Redden Bridge Wines is created. Since the inception of the vineyard in 1996, Greg & Emma Koch have capitalised on the terroir of Wrattonbully and incorporated their passion for sustainability through the use of organic, biodynamic and biological viticultural techniques. Everything which is removed from the soil through farming, is returned to the soil, ensuring sustained health for the vine, and the consumer alike. The result? Wines with great sugar/acid balance, and clean, fruit driven flavours. Established in 2007, Mason Vineyard Management has been managing vineyards in Wrattonbully, Coonawarra and Padthaway. The company has grown grapes for large wine companies, including Treasury Wine Estate, Casella Wines, Dorrien Estate, Yalumba, Wine Grapes Australia, Maclaren Vintners and Taylors Wines. 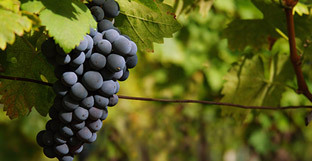 Privately owned, regional wineries such as DiGiorgio Family Wines, Bellwether Wines, Limestone Coast Wines and Cape Jaffa have also received grapes. Rob has worked in the wine industry since 1997 in vineyard establishment and management. 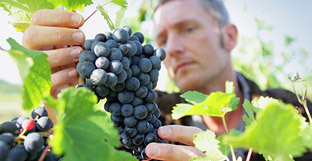 In addition, Mason Vineyard Management operates contracted services including barrel pruning, sweep and mulching, summer trimming, recycling fungicide spraying and post knocking. Our Wine Producers are Wine Lovers and they are ready delight your senses. During the red wine boom of the mid nineties, Australia's large winemakers began broad-acre vine plantings at Wrattonbully, adjoining Coonawarra's north-eastern boundary. Ten years later, the area contributed large volumes of high quality fruit for many popular wine brands. But nobody new for sure how high fruit quality might go in future. And ten years on, we know quality can be about as good as it gets in Australia. The area now contributes to some of our greatest wines, but also produces lovely, elegant reds. Limestone Caves are a feature of the area, with the region being home to the World Heritage Listed Naracoorte Caves. Many caves were discovered beneith vineyards as they were developed, some of which contained significant ancient fossils and prehistoric remains. Find out what is happening around the region as well as the latest news, wine show results and media releases. The heart and soul of the Wrattonbully region are its people and producers. Discover who they are and hear their stories. © Copyright 2019 Wrattonbully Wine Region... All Rights Reserved.